Simple solution to start the Windows 7 cmd.exe in administrator (admin) mode! 1.) ... Start in start menu the cmd.exe in administrator mode! 2.) ... Find in Windows-7 File Explorer the command prompt and run in administrator! 3.) ... Start the command prompt in Windows 7 as an admin via desktop shortcut! 1.) Start in start menu the cmd.exe in administrator mode! Please click on "Start" (Windows-Logo), then enter "cmd.exe" and execute with keys [Shift]+[CTRL]+[ENTER] (Picture-1). See Picture-1! PS: [Shift]+[CTRL]+[ENTER] is required to start (execute) the command prompt "cmd.exe" in administrative mode! Whit only [ENTER] is normal mode and many admin features does not work. You can start every windows process with [Shift]+[CTRL]+[ENTER] as an Administrator! 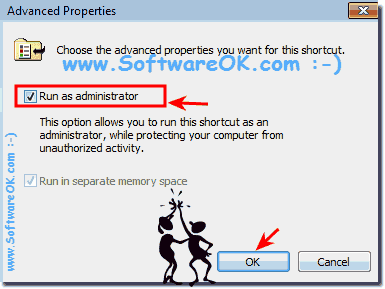 Optional right mouse click and Run as administrator! 2.) Find in Windows-7 File Explorer the command prompt and run in administrator! To find the cmd.exe please start the Windows Explorer [Win-Logo]+[E], then tap it into the address bar shell:system or C:\Windows\System32 and confirm with Enter. (Image-2) Find the Windows 7 cmd.exe MS-Explorer and run! 3.) 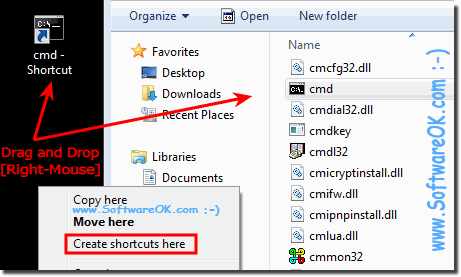 Start the command prompt in Windows 7 as an admin via desktop shortcut! Please use the ... Solution 2 and do a drag and drop action via right mouse, and create the shortcut. Windows 7 desktop. And change the properties of the shortcut to start it always in administrative mode! 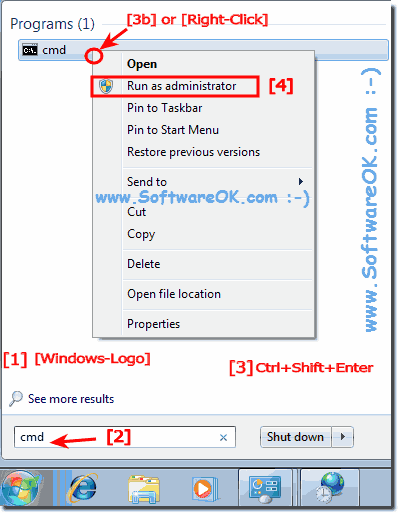 (Image-3) Windows 7 administrator mode shortcut for cmd.exe! This method works in Windows 7 and also in the new Windows 10 / 8.1, if they both have a Windows Explorer. (Image-4) shortcut for cmd.exe and admin run! There are situations that you can not do so fast without the command line on windows. For example, if you have a prepared command on your computer, it will execute quickly you command. (Image-5) Windows 7 cmd.exe in administrator shortcut! Windows-7 - FAQ-23: Start the Windows 7 cmd.exe in administrator mode?